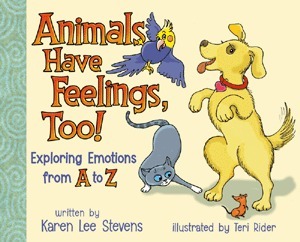 I’m participating in the Pump Up Your Book, book tour for ANIMALS HAVE FEELINGS TOO!. To see other stops on the tour including guests posts, interviews and book reviews, click HERE. Sandy is a wonderful family dog. We follow along on her busy day going for walks, taking naps, and even coming across some pesky raccoons. This book is more about just being happy, sad, or angry. Stevens explores the emotions of envious, jolly, worried and even, zonked. 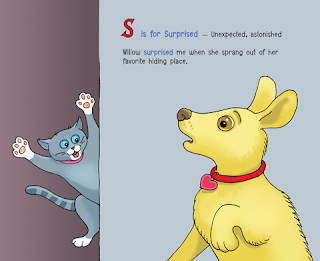 Each emotion is clearly shown through the expertly done illustrations and then explained in words through both a definition and Sandy’s behaviors. 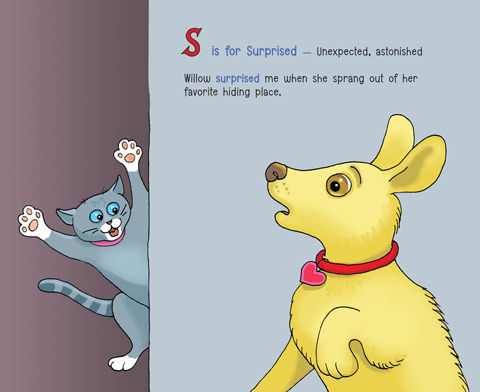 Even though this book is mainly about Sandy, the dog, you will see emotions from other animals including Willow, the cat. Children will find the story funny, silly, and enjoyable and one they will want to read again and again. Parents can use this book to help their child name and express their feelings. Stevens’ book is an absolute delight and one I will be keeping in my stash to share with my nieces and nephews and well as my friend’s children when they come to play. Stevens has also written a lesson plan for teachers to go along with this book including coloring pages and activities for use with a feelings unit in school. This book will definitely be going along on subbing dates in the lower elementary classes for use when I need a time-filler. All the proceeds from the sale of this book support ARF! (Animals + Reading = Fun), a nonprofit organization started by Karen Lee Stevens. She launched ARF! 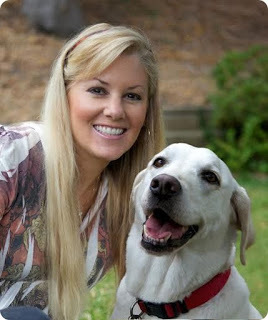 in 2013 to have dog therapy teams visit children in grades K-6 at several Title I schools and libraries throughout Santa Barbara, California. The kids are allowed to read to the dogs and has been a huge hit with the children….and the dogs too! For more about the foundation, click HERE. In February, 2013, Karen launched ARF! (Animals + Reading = Fun! ), a unique literacy program that gives children from all walks of life an opportunity to improve their reading skills and inspire them to become life-long readers by reading aloud to specially trained therapy dogs. For more information about the author, her organization, and her books, click HERE. You can also find the author on Facebook, HERE and Twitter, HERE. 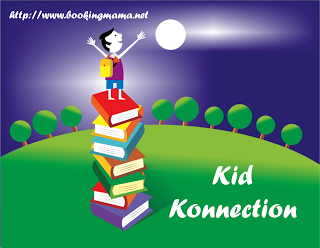 I will be linking up my review on Saturday with other bloggers on Booking Mama’s Kid Konnection. To see other great posts about children’s and YA books, click HERE. Thanks to the author for sending me a copy of the book for the purpose of this review. This review is my honest opinion. I was not compensated in any way for this review. If you choose to purchase the book through the above link, I may receive a small commission without you having to pay a cent more for your purchase. Thanks for supporting SincerelyStacie.com. 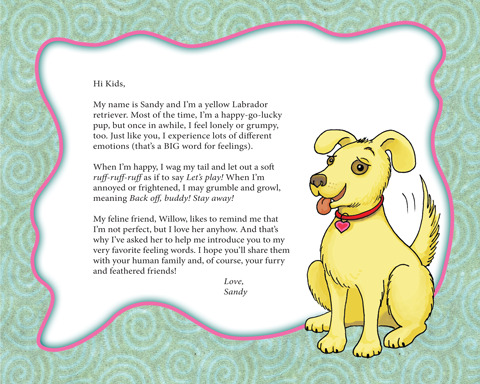 Sandy says… Thank you for your wonderful review of our book! ARF! ARF! Thanks for the wonderful review of our book, Stacie! Love your blog, and will share it with others.